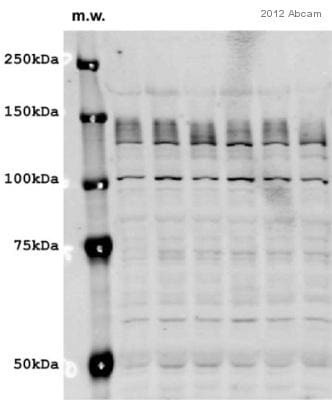 Synthetic peptide conjugated to KLH derived from within residues 850 to the C-terminus of Human Lipin 1. 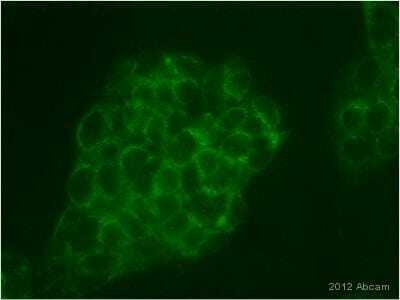 This antibody gave a positive signal in the following Mouse Tissue Lysates: Liver; Pancreas, Kidney. Our Abpromise guarantee covers the use of ab70138 in the following tested applications. WB Use a concentration of 1 µg/ml. Detects a band of approximately 110 kDa (predicted molecular weight: 99 kDa). Plays important roles in controlling the metabolism of fatty acids at differents levels. Acts as a magnesium-dependent phosphatidate phosphatase enzyme which catalyzes the conversion of phosphatidic acid to diacylglycerol during triglyceride, phosphatidylcholine and phosphatidylethanolamine biosynthesis in the reticulum endoplasmic membrane. Acts also as a nuclear transcriptional coactivator for PPARGC1A/PPARA to modulate lipid metabolism gene expression (By similarity). Is involved in adipocyte differentiation. May also be involved in mitochondrial fission by converting phosphatidic acid to diacylglycerol. Abundant in adipose tissue and skeletal muscle. Lower levels in some portions of the digestive tract. Defects in LPIN1 are a cause of autosomal recessive acute recurrent myoglobinuria (ARARM) [MIM:268200]; also known as acute recurrent rhabdomyolysis. Recurrent myoglobinuria is characterized by recurrent attacks of rhabdomyolysis (necrosis or disintegration of skeletal muscle) associated with muscle pain and weakness and followed by excretion of myoglobin in the urine. Renal failure may occasionally occur. Onset is usually in early childhood under the age of 5 years. Belongs to the lipin family. Contains one Leu-Xaa-Xaa-Ile-Leu (LXXIL), a transcriptional binding motif, which mediates interaction with PPARA. Contains 1 Asp-Xaa-Asp-Xaa-Thr (DXDXT) motif, a catalytic motif essential for phosphatidate phosphatase activity. Phosphorylated at multiple sites in response to insulin. Phosphorylation is controlled by the mTOR signaling pathway (By similarity). Dephosphorylated in response to epinephrine and oleic acid. Nucleus. Cytoplasm > cytosol. Endoplasmic reticulum membrane. Publishing research using ab70138? Please let us know so that we can cite the reference in this datasheet.